Social media is quickly rising in preeminence in the advertising world. And while there are very viable uses for other advertising platforms (e.g. newspaper, radio, Google pay-per-click, etc), social media in its many forms continues to evolve into a more and more competitive option for small businesses to get the word out about their products and services. According to bluecorona.com, 81% of millennials checked their Twitter every day in 2017. 79% of American internet users actively use Facebook including 75% of men and 83% of women. The average social media user spends almost two hours a day surfing social media. On any given day, Snapchat reaches 41% of 18 to 34-year-olds in the US. There’s hundreds more of these statistics, and they’re all saying the same thing: social media is big. And the bottom line is that if your small business is going to make the jump from the past to the future you’re going to need to get onto social media and grab those young, soon-to-have-money customers to buy your awesome product or visit your awesome store. But there’s a problem: you’re a 40s+ small business owner. For you, social media is a huge, distant, and otherwise uninteresting platform. You have no idea even how to begin, and you don’t know if you even want to. You have no knowledge and even less time to begin to jump into the pool that is online advertising. You have enough trouble even logging into Facebook or Twitter (if you even have an account to begin with!) nonetheless operating a multi-platform advertising campaign. Well, there’s good news. Though it may seem daunting (the Facebook ad manager does look like something complicated a budget report software would spit out), the truth is that social media advertising isn’t nearly as difficult to wade into as it may seem. At the end of this post, you’ll know how to conceptualize and create a Facebook ad simply and in the most streamlined way possible. There are three basic benefits to social media advertising that it has over traditional mediums (e.g. newspaper, radio, billboard, etc). Social media advertising allows you to target specific demographics, age ranges, interest ranges, jobs, hobbies and personality traits with your product. Have a homemade coffee blend? Market it to java-loving hipsters between the ages of 18 and 25. Own a custom picture-frame company? Market your frames to photographers and grandmas based on their interests in photography and pictures of their grandkids. The possibilities are endless. There are literally no bounds to social media advertising (other than the bounds of the internet). Social media advertising can reach anywhere, anytime, to anyone in the entire world (provided the audience you’re targeting is on that particular social media platform). For example, from Boise, Idaho you can market your heavy-duty soap business to coal workers in the middle of Ukraine. From your home office in La Grande, Oregon, you can market your handmade alpaca sweaters to hipsters in the northernmost parts of Canada (if there are any hipsters in Northern Canada, that is). Bottom line, anywhere, anytime, anyone. 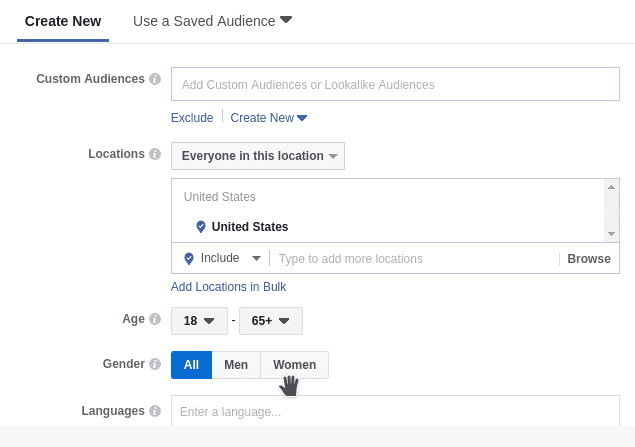 There are no limits to the demographics, ages, locations, or time slots you can target using the social media platforms’ highly-functional targeting algorithms. Social media allows for immediate response by the viewer of the ad. In the past, when a customer saw an ad in the newspaper, there was nothing they could do (short of pulling out their phone and making a time-consuming phone call) to respond to the ad or make a purchase. Same with radio and broadcast television. Social media, on the other hand, allows for immediate response to your product by the viewer of the ad and, if you plan it right, even an immediate purchase. No non-internet advertising medium offers this and it is a powerful sales tool. Ever been frustrated at the newspaper, radio, and television’s inability to tell you exactly how many people have seen your ad and responded to it? Well, that frustration’s old news on social media. All social media platforms have built in (and free!) tools to quantify and report exactly what the reach and response to your ad has been. You can see how many people saw your ad, if it’s a video how long they viewed it for, what type of people liked it the most (e.g. women between the ages of 45 and 65) and even how many people clicked on it to learn more hopefully taking them right to your website. All of this data is gathered by social media and can be downloaded and printed right off for your records or analysis and calculating ROI. Alright, you’ve convinced me! I need to be advertising on social media. But how do I go about it? What is it that you’re really selling? Is it coffee? Is it furniture? Is it dog food? No. You’re selling comfort. You’re selling social status and acceptance. You’re selling health and wellness for your pet. Social media advertising works best if you boil down your product to the most basic, fundamental and emotional desire that is being filled with your product and focus in on that. E.G., if you’re selling furniture, you’re not selling furniture, you’re selling comfort and rest. If you’re selling craft coffee, you’re not selling coffee, you’re probably selling good taste, class, and the status of drinking something not Folgers and MJB. So what are you selling? Really thinking about your true emotional product will help your campaign to be far more effective on social media and on other advertising mediums as well. Once you’ve figured but what you’re really selling, you have to figure out how exactly to sell it. Think about the grocery store: it’s not always the best product that gets the sale, sometimes it’s also the product with the most appealing packaging. Your online packaging is essential to how many people click on your ad and make a purchase. That being said, how are you going to package your product? Are you going to package your product as a blog post? As a photo? As a video? People on social media respond extremely well to imagery. Too much wordy text is a great way to get people not to buy your product. Thinking about your packaging might involve being a little bit creative. Are you selling comfortable furniture? Maybe you should take some pictures of your brother relaxing comfortably in your chair. Selling craft coffee? Grab some of your friends, get them dressed up like hipsters and have them take a big old sip of your coffee and sigh and capture it on video. Have fun with this step. Be creative. People will be more interested in your ad if you do. You’ve got your product and packaging. But now you have to ask, who are you selling your product to? Every product has an ideal customer. You’re not going to sell dog food to gourmet cooks (unless that gourmet cook has a pet schnauzer he likes to talk to while he bakes his organic braised leeks with mozzarella). So who is your idea customer, the type person who is likely to buy your product? Are they old or young? Male or female? Gay or straight? If you’re selling paint, this customer may be 30+ contractors or people who are interested in home-improvement. If you’re selling purified water, they might be 20-35 year old health-nuts or people who live in cities with poor water quality (a clever google search may reveal which cities these are). In marketing-language we call these theoretical people “buyer personas” and Hubspot has a great article on how to craft these for your business. So you’ve caught the attention of someone with your awesome ad. But what do they do now? The action of the customer after they’ve seen your ad is called the “action point”. Getting your customer from the point of attention to purchase with as much ease and as little time as possible is essential to killing it on social media advertising. So what is your customer’s action point? Do you want them to go your website? To like your Facebook page? To make a purchase? To contact you for a consultation? Social media platforms have different built-in action points that can be customized for the particular needs of your campaign and with a little forethought you will be able to smoothely and quickly transition that would-be customer into the quickest way to making a purchase. Okay, you’ve come all this way and you haven’t even logged into social media. That’s great! The good news is that you’ve done all the hard work already and you haven’t even clicked on a single button! It’s all just imputing data from here. Here are your first steps in creating your first social media ad. Note: I’ll be using Facebook as your flagship social media profile for a couple reasons. Facebook is still the broadest and most all-encompassing social media platform out there. Facebook’s advertising capability is by far the most developed. In the 2017 election Donald Trump’s social marketing manager attributed his Facebook campaign directly to his victory in the election. It’s a powerful tool. If you haven’t already, go to Facebook.com and create a profile for yourself. Or get someone more tech-savvy to do it for you. It’s a simple process and all you need is an email address and a name. Then, after you create a personal page, navigate to the top right menu bar and click “create page”. Create a page for your business on Facebook. Hubspot also has a great 5-point tutorial on how to do this effectively if you’re interested in a walkthrough. Spend however much time you want and customize your profiles much as you want. Ultimately you don’t have to spend much time customizing to run an ad. If you want, just get the basics up (profile picture, basic description, etc.) and let’s move on. In the top right corner click the menu and scroll down to the ad manager. Once the ad manager comes up, don’t panic. It’s less complicated than it looks. Ignore all the mass of bells and whistles and graphs and click on the Create Ad in the top right corner. When the next screen comes up, again, don’t panic when the fifteen or so options come up to choose from. These are simply the different types of ads you can run. 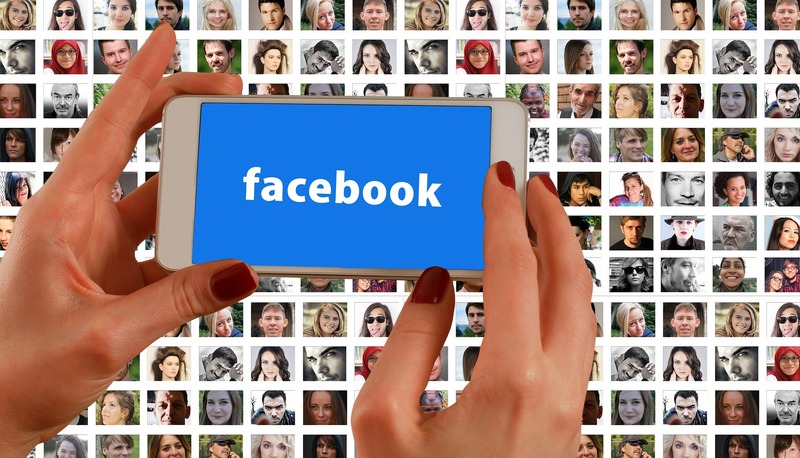 With Facebook, you can “optimize” for a bunch of different goals including more likes on your Facebook page, messages to your Facebook account, traffic to your website, and more. You can explore these options at your leisure. For now we’re going to send people to your business’ website. Choose “Traffic” as your campaign and enter a name for your campaign below. Use something simple like “Test Campaign” or “My First Campaign”. On the next page of the campaign skip all the sections up to the “Traffic” section. Under the “Traffic” section, it’s going to ask you where you want to drive your traffic to. Choose “website” and move on to the “Audience” section. Remember your persona you thought about earlier? It’s time to use it. In this section, you can choose an audience based on location, age, interest, etc. The options are almost limitless. If there is an interest someone has liked or subscribed to on Facebook, it’s probably on the list of traits to target by. Go ahead and play around with these options and narrow down your audience to the ideal people who would be in ideal situations and interests to purchase your product. Use your persona information that you came up with in the planning phase. The way budgeting works on Facebook is pretty simple. 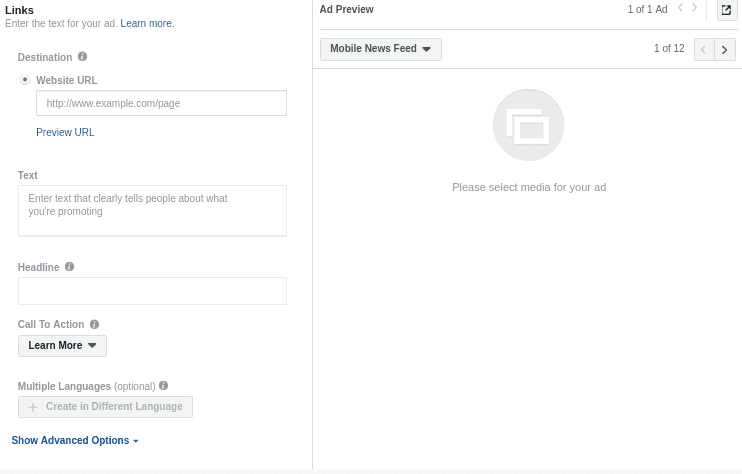 You pay Facebook, Facebook delivers your ad to the people you want. Imagine Facebook like a newspaper delivery boy: he shows up on your doorstep, you give him the paper, tell him you only want him to deliver it to people on M Street with new cars, pay him, and he delivers the papers. Clean, simple, easy, effective. The only thing that you have to choose is how much to pay him. The more you pay him, the more houses he’ll visit. A good starting point is to run your ad for about a week and to invest $15. This will give you a very basic understanding and will deliver your ad to about 2000-3000 people. It will give you a mess of data to work with and show you how the Facebook advertising works at its most basic level. Practically, skip all the sections after the “Audience” section until you get to the “Budget” section. 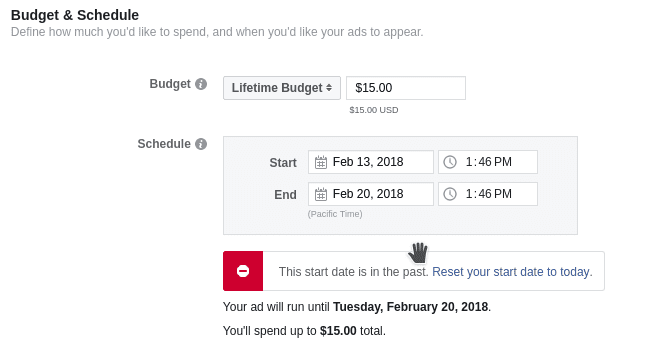 In the selection bar, choose “Lifetime Budget” and enter in your amount next to it. Then use the calendar tool to choose how long you want to let it run. Ignore all the other options and leave them on their standard choice. Click “Continue” to move onto the next page. So how did you decide to package your product? Here’s the point where it’s relevant. On the final page of your campaign creation, you’re going to upload your media. So whether you chose to use a single picture, a series of pictures, or a video, here’s where you upload it and create the look of your ad. In the “Format” bar, select which media type you’re wanting to use and how you want it to look. If you have multiple pictures, you can create a carousel, a slide show, or a collection. After choosing how you want your media to look, use the next section down to upload your video or photo. Note: Facebook has specific image and video sizes required to be used on Facebook. If your photo is too big, it can be cropped down using the built-in cropping tool. After uploading your media head down to the “Links” section. The links section essentially tells Facebook where you want your ad to send people when they click on it. In this case, we chose “website” earlier in this process, so in the box labeled “website URL” enter in your business website. That way when people click on your ad they’ll be delivered right to your site to learn more or buy (if your site is set up for eCommerce). After this, enter a brief description of your product in the “text” box. When you’re writing this description, think back to your “product” theory; e.g., what you’re really selling. You want your text to sell not just your item but your real product as well. Hand-made, cold-weather alpaca sweaters for rough, rugged weather shipped right to your door anywhere. Lumberjacks are looking for something durable and warm to work in. And the fact that the sweaters can be shipped anywhere in the world would be appealing to someone who lived in a remote location like Northern Canada. Play around with this description a little bit and come up with something you would like. If it helps, try to put yourself in the place of your target persona: would I be interested by this offer? Would this appeal to me if I were this person I’m selling to? After you enter your description, write your Headline in the box below. Your “Headline” is the name or brief description of your product. So keeping with the alpaca sweaters example, your headline might be Rugged Hand Made Work Sweaters, Shipped Anywhere. Brief, quick, and to the point. And you’re done! As soon as your ad is approved, your picture and text will be delivered right to the proverbial doorstep of people who you specified in your audience. Your money is now working for you 24/7 for as long as you selected it to run for. If you’re interested in analyzing the data from your campaign, AdExpresso has a great article on how to use the Ad Manager to monitor and tweak your ad campaign that picks up right where this blog post leaves off. But for now–like the AdExpresso article says to do–sit back and have a cup of coffee. You did it! Your small business now has fully-functioning social media campaign running while you sip your cup of joe. 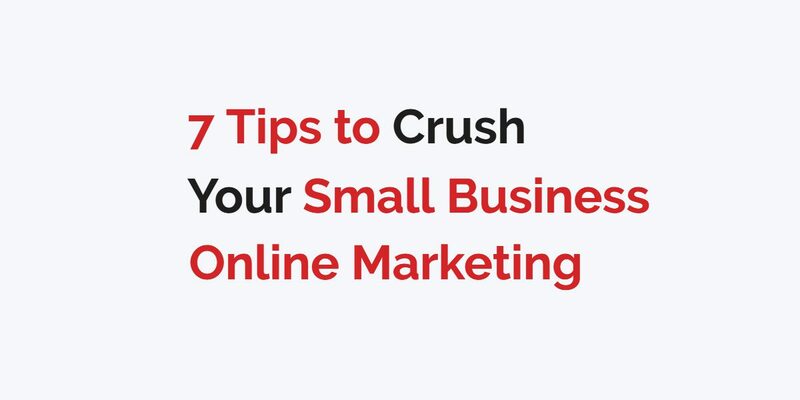 You’re well on your way to getting your small business fully-digitized and snagging all those eager-to-buy online customers floating around on social media. Congratulations!